I wonder if the presence of etched LC filters on the PCB is due to a possible intention to use the same PCB at higher frequencies in some future model via component changes. If I'd spent the incredible amount of effort to design a beautiful PCB like that, I'd try to enable sort of option that if technically feasible. What, you mean make one product but then release different bandwidths with just a software key? Rigol wouldn't do that, surely? I wonder if the presence of etched LC filters on the PCB is due to a possible intention to use the same PCB at higher frequencies in some future model via component changes. this is IF filter, it does not have anything to do with frequency range of a SA. did I spot some JBC tips in this video? I have a JBC CD series iron now. The classic analog spectrum analyzer design is multiple conversion - with an up-converting input stage. In your tear down, the 1st IF bandpass filter is likely the one formed by the |unun| shaped traces. Probably 200 MHz or so bandwidth, centered at the 1st IF. In a classic analog spectrum analyzer, this high IF is then amplified and run to a second mixer where it is down converted - perhaps to an IF around 300 MHz where some very wide resolution bandwidth filters can be used, and then a third conversion to a much lower frequency such as 21.4 MHz where crystal filters with resolution in the tens of Hz or less are feasible. Looking at your video, the design seems to follow the classic analog approach with up-conversion to the 2 GHz range or so, followed by a second mixer / LO to a lower frequency. Then into the ADC for the rest of the signal processing. the little transformer around the adc is a balun , or more precisely an unbal. they go singl eended to differential. that adc most likely has differential inputs. It's a bit hard to see, but it looks like a bad soldering job...? It looks like not enough heat has been applied to those parts -- probably because they're metal and bonded straight to the ground plane and applying too much heat would lead to damage to the pads. However, they could have helped the situation by using thermal relief on the through holes -- it doesn't look like they have. A bit of preheating could make a big difference. Cool! After some research I decided to buy a CD-B because of their tip technology and the easy way to change them. I found it somewhat difficult to get my hand on one as most dealers only sell to businesses but one Austrian ( not Australian ) dealer also sells via eBay. It would be very interesting to hear about your impressions in a video blog. This is indeed a classic RF spectrum analyzer design. I've traced out some of top-level blocks in the RF deck. The engineering of this unit is incredible for the price. My hats down to the engineers who designed this. Very nice product. I wonder what are the actual LO frequencies used in this project and cutoff frequencies of the IF filters. If I remember correctly, HP in their older SA models used 321 MHz and 21.7 MHz for the 2nd and 3rd IF filters respectively. Awesome work, thanks. Looks good to me. I had a quick look at the front end section as this is quite a critical area for performance and I'm not sure you have it labelled correctly. 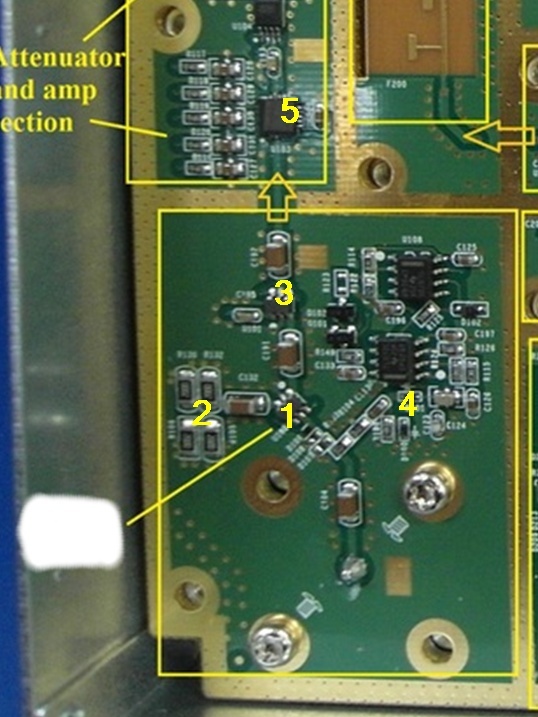 Item 4 looks to be a basic diode based wideband RF detector and I suspect one of its roles is to rapidly sense input overload at high RF power levels that could cause damage to the front end attenuator or mixer. So I think item 1 is an RF switch (for damage protection) and not an LNA as labelled in the earlier image. Item 3 looks to be another RF switch and I suspect that this switches in a test signal? Does the analyser have a front end test signal selection in the menu? eg something like 100MHz and -10dBm would be typical for an analyser.